Rummaging around on Twitter, I found a most intriguing idea. A research team at the University of Kent, headed by Dr Jennie Batchelor (@jenniebatchelor on Twitter), is investigating the content and development of an eighteenth century periodical, The Lady’s Magazine. The magazine was sold with pull-out song sheets – and pull-out designs for embroidery. Generally speaking, they don’t survive, having been pulled out and used as they were intended to be. But recently, a bound volume of a half-year (1796) came to light, with some patterns included. A little more discussion, the idea arose of scanning those designs for modern stitchers to play with, and The Great Lady’s Magazine Stitch-Off was born. For more on that, visit the project’s blog post on the subject. I couldn’t resist the idea. I’ve downloaded the first five designs, and started to stare at them thoughtfully. The project suggests that stitchers might like to work modern versions as well as in some cases working versions which are as historically accurate as possible, so there is going to be quite a variety to look at. I’ve decided that I’m going to work the designs on a pashmina shawl, and while I am waiting for it to arrive, I’m contemplating what I might choose to do, from highly modern needle-felted versions, to more or less classical embroidery. I wanted to share it with you before I started stitching, because the vagaries of the post may substantially delay my first stitch, and a few of you may want to join in. Do let the project know if you do, they’re really enjoying what they’ve been seeing! Update: They have recently posted their first round-up of Stitch Off contributions and planned contributions. It looks like a worthwhile project. The little sprigs are pretty. Have you decided which pattern to work on your pashmina? That is so wonderful! I love finding old things and giving them a contemporary feel. I know you will make it fabulous! Oh, this is a wonderful project. I love it when the old can be made new again. Can’t wait to see your work as it progresses. It will be beautiful as always. I saw that article. I’m curious to see what will come of your adventure 🙂 I love the idea of stitching it on a pashmina shawl. What a great idea! My son just returned from Nepal and brought me a pink pashmina with 30% silk. I’ll definitely look at this site. What a great idea. I am going to take this into my guild. I think this would make a great challenge for 2016. Thank you so much for that link! How awesome that they found it and that they are sharing it. I wonder what the music sounds like, too. I hope they wind up sharing that part in one way or another. I have been in touch with the team at the University and am now in the process of putting this Guild challenge together. Just a query for your opinion. The dimensions printed on the bottom of each pattern seem to me to be relevant for the printing of the magazine not for the embroiderers’. I suspect that they would have enlarged or reduced the size of the pattern to suit their end purpose. What do you think? How marvelous! 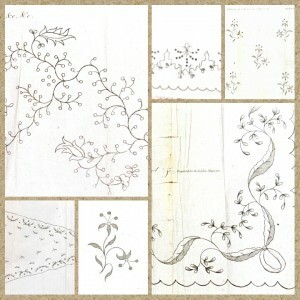 I love the fact that these designs will be stitched/interpreted by needle workers over 200 years later. A good design lasts! So elegant and ‘spriggy!’ Makes me think of Jane Austen heroines in their sprig muslins. What beautiful patterns! Visiting that link was kind of like going down the rabbit hole… I got caught up in reading about the serialized novel and it’s writer. How fascinating their research into that magazine and its contents must be! Thanks for linking up your Holiday Tablecloth post to last week’s Stitchery Link Party. I wonder if 300 years from now, someone will access our internet blogs and be trying to discover information about us from the things we write about! What a great challenge! Your interest in history and embroidery with original patterns from 1796 on a lovely shawl–what’s not to like! What wonderful ephemera!! Were the men’s hankies really pennant shaped, I wonder?